What is the Best Roller Cover to Use? There are many different tools and methodologies available when it comes to applying paint. The most common tools include brushes, rollers, and sprayers. In some cases foam pads, rags, and sea sponges can be utilized for specialty applications such as faux painting. Paint rollers are the most distinguishable because of their relative ease of use for even non-professional painters. If operated properly, these rollers can produce an excellent finish for most large flat surfaces, such as drywall. Though a sprayer can deliver the most superior paint finish, often times it is not practical for small confined areas, or spaces that are occupied. 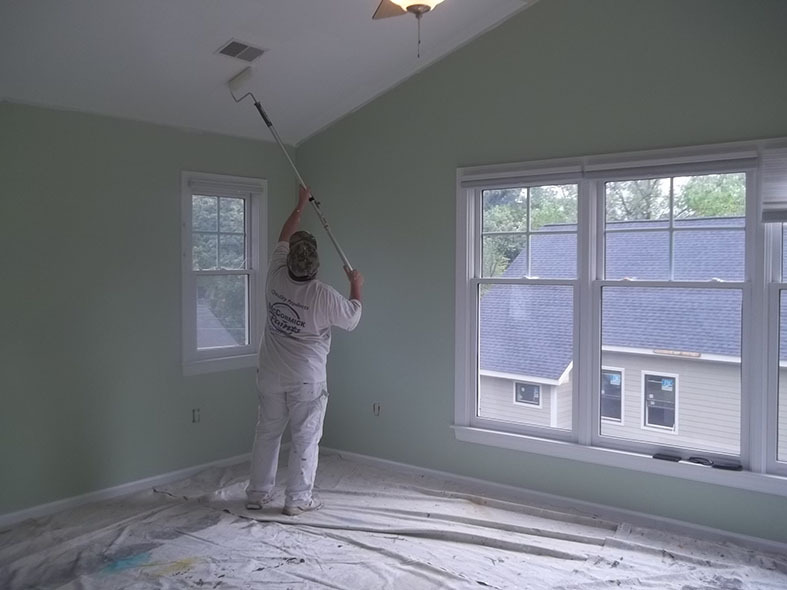 Professional paint results are produced by professional painters who employ the correct type of tools and materials for a particular project. That being said, people with limited painting experience frequently use the wrong type of roller cover and don’t know how to use it correctly. Most interior projects that we deal with have some type of issue with the paint finish that was the result of a Handyman or someone using the wrong roller cover for the paint type. We fix those problems that include roller mark lines and stripes, paint splotches, areas that were missed, and lint that was left behind after using a cheap roller cover. Similar to choosing the right brush, selecting the correct type of paint roller makes all the difference in the finished result. Not only that, a high quality paint roller cover that is best suited for the job will reduce the actual time spent painting a specified area. Many Independent Paint Dealers like Benjamin Moore sell very high quality paint tools and materials. The cost is significantly higher in a lot of cases, however, your walls will look so much better and you will save yourself a lot of extra time in the application process and clean-up. Inexpensive discount packs of roller covers are generally not good and should be avoided. There are a couple of things to consider when deciding upon the right type of roller cover that should be used for application. Determining the paint type and the surface that to which it will be applied are essential prior to deciding upon which type of roller cover to utilize. Differences in roller covers vary by size of the roller cover, its composition, and the length of the fibers otherwise known as the nap size. There are different roller covers designed for every type of application. 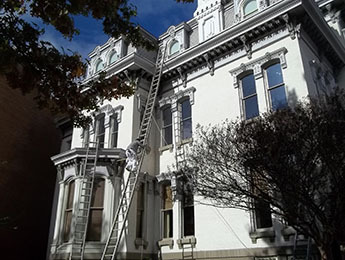 Any experienced paint applicator should assess the project and closely analyze the substrate to ascertain the correct type of materials and tools to be used for the job. Often times the big Home Stores will feature some roller covers that have packaging that indicate that they can be used with all paints, this is not necessarily accurate. That is like saying a separate prime application isn’t necessary because the paint is labeled “paint and primer in one”. We consider these gimmicks as more of a clever tactic to increase awareness amongst average Homeowners and drive more purchases for these products. They are indeed much less expensive than real quality roller covers. However, for professional results we recommend choosing a roller cover that is specifically designed for your application. Roller covers that are made from synthetic nylon or polyester fibers are adequate for most latex paint applications. These synthetic roller covers are made with different blends of nylon, polyester, acrylic, and rayon composites. They would also suffice for most finishes as well, including flat, eggshell, and satin based finishes. If you prefer more professional-quality results, then a natural woven roller type cover would be recommended. Natural roller fabric such as lambs-wool have excellent capacity and provide a better finish than any other type of roller cover, and most museum quality painters in Washington DC use them on a daily basis. An assessment of the surface that is going to be painted, as well as its size, should indicate the best nap length that would be the most practical for the job. 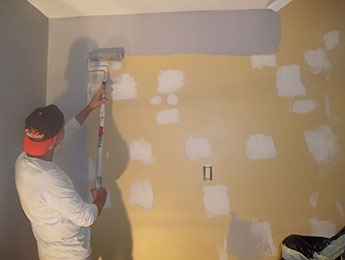 The objective should be to select a roller cover that will hold as much paint as possible, provide average stipple, and release it onto the wall with minimal splattering. Most drywall surfaces, paneling, and metal would call for a short nap from 1/8” to 3/16”. For previously painted drywall surfaces, a nap from 3/8” to 5/16” would be most appropriate. The slightly longer nap will absorb more paint and yield minimal stipple. 1- ½” covers are best suited for heavily textured surfaces and concrete block. As a leading paint application provider in the greater Washington DC area, we are constantly testing and evaluating newer types of natural and synthetic fibers used in roller covers in order to produce optimum painting results for our Customers. Needless to say, the natural fiber lambs-wool roller cover have continuously exceeded our expectations in terms of producing a faster, cleaner, and more efficient way to produce paint applications. With the new advanced coating materials that have appeared on the market, it is important for us to use the right tools and equipment to continue to deliver museum quality work. Decorative trends and new color styles tend to change year after year. This is especially true when you are dealing with interior residential spaces. It is the job of Color Consultant to research these trends and have their eyes peeled for some of the new colors that are in vogue. If you are looking for some inspiration, you have come to the right place. We have put together a list of five of the most popular paint color trends as the 2017 painting season gets busy! 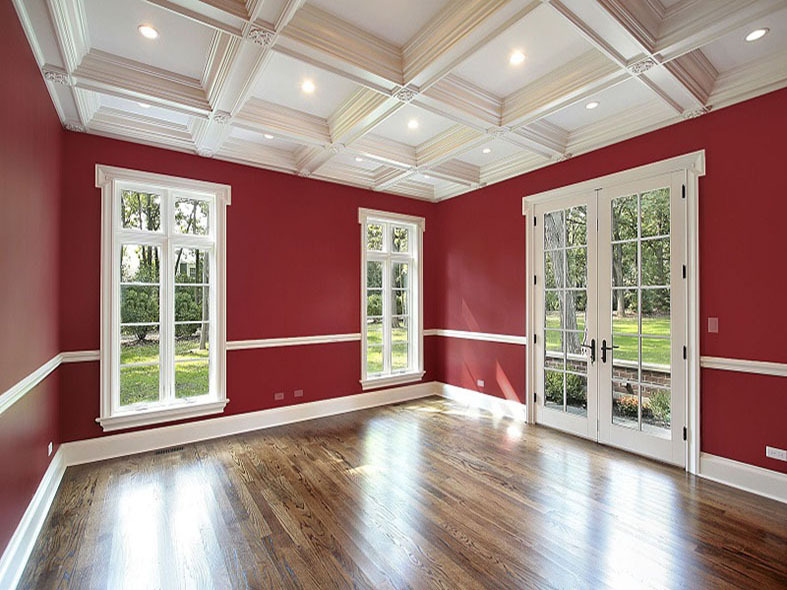 There are a myriad of different shades of red that can flow with with most decorative styles and color pallets. The challenge is finding a red paint color that has the right undertones for the decor of your home. If you're thinking about a vibrant red option, Sherwin-Williams Show Stopper would be the right choice for 2017. This pure red is a bold choice for any space, and is definitely has been a common theme for many front doors accent walls. As has always been the case, this type of color has always worked well indoors for a room that needs some drama like a living or dining room. Sherwin Williams announced Poised Taupe to be their color of the year for 2017, and it has been a popular choice for many homeowners. Although they consider it more along the lines of a grayish brown color, some people have described it to have a mix of mauve, pink, with purple undertones. There has been definitely been a lot of opinions posted about this color on various Blogs, including Instagram and Pinterest. Most people have considered it to be the perfect mix of a neutral cool gray with a woodsy neutral brown color. If the previous five years have been any indication about the tendency towards grayish brown hues, then we are confident something similar to this color will still be popular in 2017. Byzantine Blue was Glidden's 2017 Color of the Year, and it is another type of soothing blue paint color that can work in any room. This color has a contemporary feel and it has a combination of shades of aqua, deep blue and light green. To contrast the wood trim, a plain white or bright white color is always a must. This is traditionally a great hue for holiday and seaside homes. The faint violet undertone definitely gives it an unexpected glow that would be dramatic in a special area of the home. Although this color would look good in any room, it could also serve as a nice color for an exterior front door. Valspar's 2017 Color of the Year is Crushed Oregano and it's a bold subdued color in a time of neutral paint color popularity. It is more of an olive green type of color with a very slight yellow undertone, which would be a good option for a family room or study. Obviously, the rest of the room's decor should be well thought out, so that it looks the part and doesn't appear out of place. For example, white kitchen cabinets would offset this type of bold color, and would be a fashionable design idea. You will want to sample this dynamic paint color before you commit to paint all of the walls to be sure that it's right for your space. Sherwin Williams HGTV "Natural Wonder"
Another popular Sherwin-Williams paint color is called Natural Wonder, and it's part of a palette of only twenty colors. This type of smaller paint color palette helps people make color decisions more quickly and confidently. Natural Wonder is an earth tone, and is formulated with a combination of several neutral paint colors. Earth tones like this are particularly versatile, and it can be combined with other colors in multiple ways which should flow well with any type of decor. Often times it is imperative to balance out earth tones with softer neutrals so that the space is not overwhelming, but in this case Natural Wonder would provide a warm and cozy feeling for any bedroom. What is the best type of Interior Paint Finish? Choosing the correct color for your Home is always an important factor to consider, however, there is yet another very important decision to make. With several paint finishes to choose from, it is important to be somewhat educated about the pro's and con's of each type of finish in order to determine the right finish for your Home. The four main types of finishes include: Flat, Eggshell, Matte, and Semi-Gloss Finish. 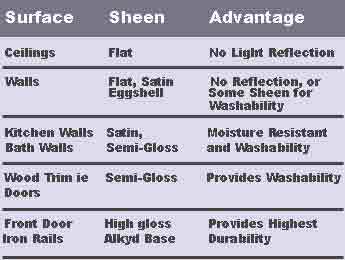 Each paint manufacturer has its own guidelines for how much sheen goes into each Paint Finish. If you buy a satin finish from one manufacturer, it will look different than the satin finish of a different manufacturer. For this reason, it is always a good idea to choose a single brand for your Painting Project in order to avoid subtle differences. Consult with a Painting Contractor for help with choosing and applying the best Paint Finish for your Interior Painting Project. High-gloss finish paints are rarely used for Interior Painting purposes because they leave a very shiny finish. Semi-gloss paints have a mildly glossy appearance and are often the paint of choice for Kitchens and Bathrooms. Rooms that are prone to moisture and mildew should be painted with a semi-gloss finish. You can even have mildew resistant properties mixed into your paint. 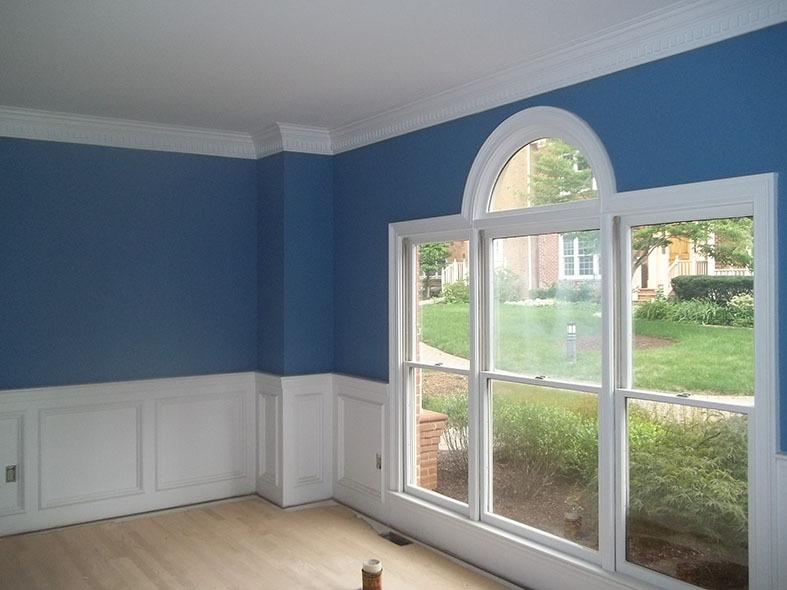 You can also use semi-gloss for trims, moldings, and doors. A satin finish has a sheen which is flatter than semi-gloss. Paints with an eggshell or satin finish is formulated to hold up to cleaning and light scrubbing. It makes a great paint choice for kids’ rooms, because you can easily wipe off the fingerprints, smudges, and dirt they might get on the wall. The only drawback with the use of Eggshell and Satin is the difficulty in touching up certain areas. Davinci's Museum Painters can help you choose the right finish for your Home! Satin finishes are also used for trim, moldings, and doors because it gives a nice decorative effect to them. Surfaces painted with an eggshell finish can also be wiped off, although not as easily as the higher-gloss and satin finish paints can. An eggshell finish has the smooth look of flat paint, but flat finishes collect dirt. A flat finish is the dullest finish of all the paint choices and does not reflect light. This makes flat paint ideal for ceiling surfaces usually. It can be a bit mind boggling navigating through all the paint choices that are on the market, but ask an Davinci's Home Painter for help! 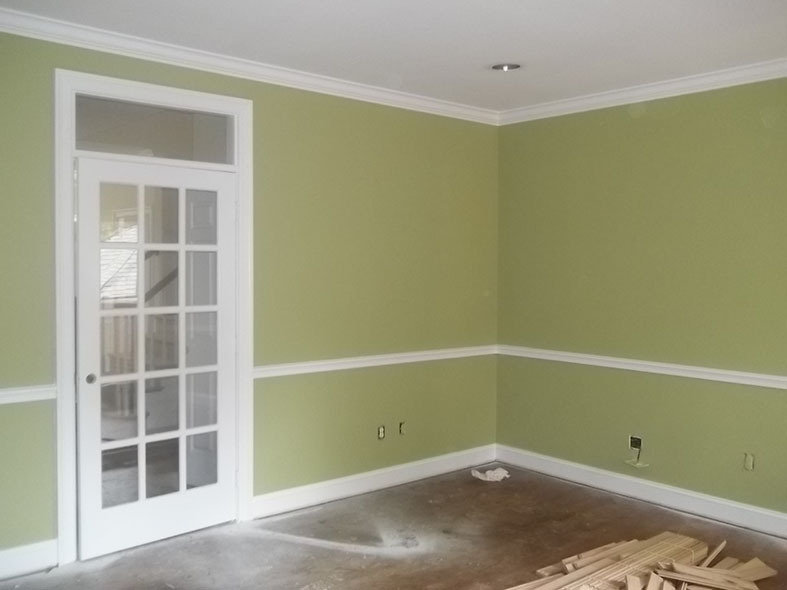 Our interior Painters are experienced with the application of the various types of Paint Finishes. We also know how to accent your furniture and other accessories with Paint Colors. 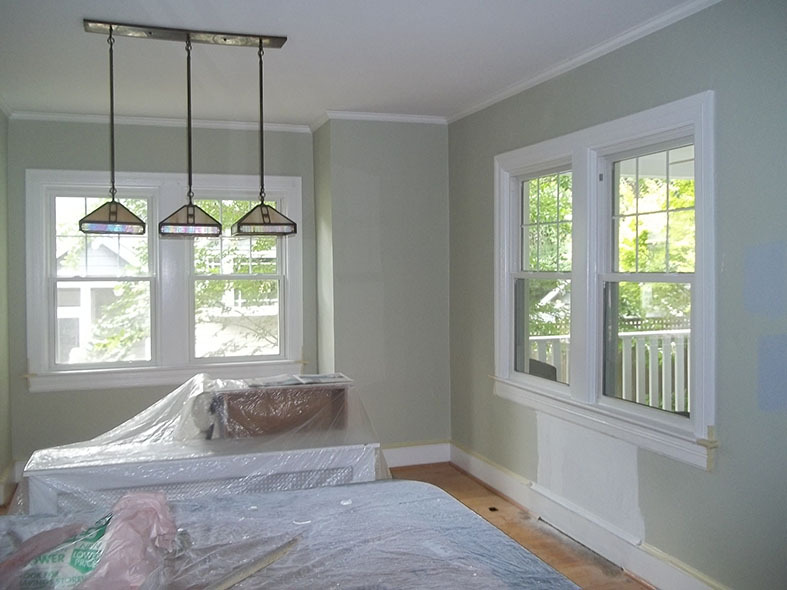 Our Painters will help you bring the color palette you are envisioning to life. Contact Davinci's Painting for all of your painting needs. Call us at (571) 314-7288 today!